Something that is a priority in my own life is how I keep my house and myself. Having my bed made, apartment clean, well groomed and showered. Is a statement to myself. That I have my life in order. Ready to do more important things. I can have friends over without being embarrassed. By making my bed every day. Taking care of my dishes after dinner. Hanging all my clothes or putting them away. Arranging my books in neat piles. Saving important mail I’ve received. Throwing away newspapers. Shows persistence and dedication. That all areas of my life are important to me. If I would let the dishes pile up, have clothes lay about and a dirty bathroom mirror. It would affect my willpower to do greater things. It makes it easier for me to take that next step towards my dream. Here are seven highly effective cleaning habits I use and hope you will find them useful. A) Make a list of what needs to be done and check them one by one. 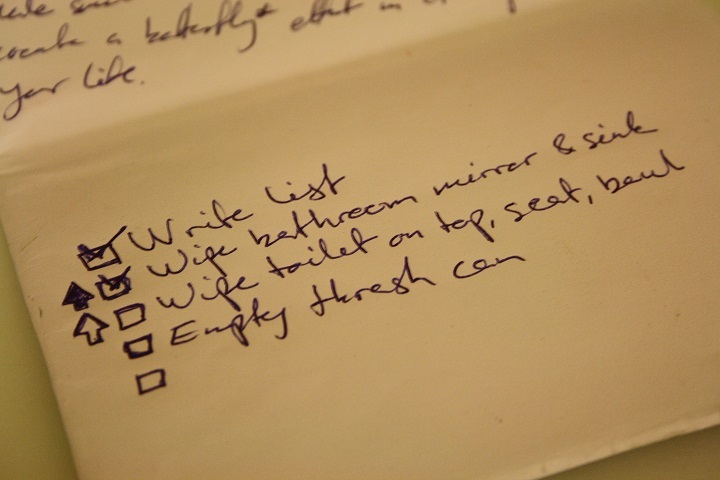 By writing a list you get a overview of what needs to be done. Make sure to do boxes in front of the text and preferably make room for outline of an up arrow. The box is there to encourage you to complete the task and check it. The up arrow is for something you have resistance to doing. But you do it anyway and give yourself a “level up” when you’ve accomplished it and get to fill it in. Think on difficult problems as a skill to level. The more you do it, the easier it gets. You could apply this to everything you do. 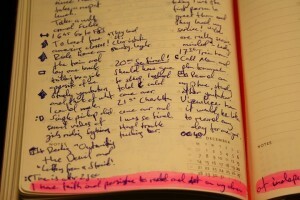 Some days my journal is filled with five level ups stacked above each other and that feels great! Wipe bathroom sink, mirror and toilet. Hang clothes that could be used again or put away to be washed. Vacuum and mop the floors. Wash my clothes and bed sheets. Wipe all door handles and around them. A simple trick I use is to simply focus on this one task. I just do this one thing until it gets done. I don’t plan what next item on the list is. Or thinking about what I’m going to do at the gym. Or anything else. I just focus on my breath and what I’m doing. Most of the time I get completely lost in my thoughts and two minutes later I realize that I’ve lost my focus. That I told some imagined story or made a plan after I get done cleaning. That’s fine, I will just focus again on my breathing and the task I’m doing. Sometimes I get lost five times in one minute. Sometimes more! But that’s okay. I just acknowledge I got lost in my thoughts and focus again on my breathing. This might be unfamiliar at first. But with practice I’ve come to love it. It puts me closer to achieve flow. Total immersion in the task makes me feel more alive. Intune with myself and my surroundings. It makes the task easier to accomplish because I’m not in a rush to accomplish twenty other things at once. Practice mindfulness helps me be calm. +Every time you do the dishes, practice mindfulness. Feel each plate you wash. Just focus on this plate and get it clean. Put it away. Focus on this plate you are about to wash. Feel it completely. Wash it with care. This builds your mindfulness. By being more mindful you learn how to handle high stressful situations better. When you feel you are about to be overrun by worry or doubt, take a deep calm breath and focus on it. By doing things immediately you train yourself to take instant action. As soon as you notice something that needs to be done, take instant action and get it done. This is a powerful technique to build. It gives you confidence to achieve other great things. That you are not a procrastinator, but a DOER. Every instant action you take compounds into effortless action. Example: I didn’t wipe my bathroom mirror regularly before. I did it when I noticed it was dirty. At that point it had probably been dirty for a week but I hadn’t noticed it. My mind was so used to my surroundings. That I didn’t notice how it gradually got worse and worse. Until it finally hit me, how dirty it was. Now I wipe my mirror and bathroom sink after every shower. The humidity of my shower helps me loosen the dirt to easily be wiped of with a towel or paper. Super easy and takes less then 30 seconds. > You will have a spotless mirror and sink every day. >> While you are at it, wipe your toilet with paper on the top, seat, outside and inside. Be prepared and clean things before they get dirty. D) Set queues when you need to do x. Right after dinner >>> Do the dishes! By doing it immeadleaty after dinner I build my habit of taking instant action. Before or after a girl comes over >>> Take out the trash! This makes me also wipe the important areas in the bathroom like mirror, sink and toilet. If I don’t have a girl over I make sure to do it at least twice a week. Every Saturday morning >>> Water my plants! That’s the only day I have “off” from work and have a relaxed morning with focus on mindfulness. Do most of my cleaning in the morning or noon. Once a week is generally enough. After I’ve watered my plants >>> Vacuum and mop the floors! 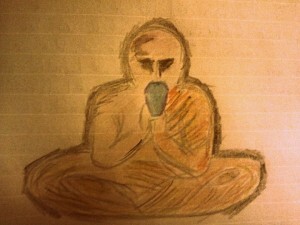 While practicing mindfulness. Take extra care to focus on my ritual of vacuuming and mopping the floor. I see it as a ritual. By creating a ritual of cleaning habits, it makes it easier to follow through. Even if I’m dead tired after work and just had two hours martial art practice. I do my dishes after I’ve eaten. If I would let it go as I do once in a while it creates a ripple effect in other areas of my life. For example when I don’t do my dishes and let it be. Next day I will have to do it, but I don’t feel like it. So I cook dinner with my other kitchen ware and let it be again. The third day I need to buy food and prepare my lunch for the next day. But I feel even less of doing it now. So I cook some frozen vegetables and beans from the cupboard. Now the fourth day I have a ton of dishes to wash, and my refrigerator is empty, and I have to prepare my lunch for tomorrow that I have no food for. When I just do my dishes, I happily prepare my lunch for tomorrow and notice early when it’s time to shop grocery’s. Be persistent and it will pay off. Having many possessions is a indicator of a cluttered mind. With every thing we have, there is a responsibility of upkeep. If I have a lot of furniture and small things. Every piece of furniture and stuff needs to be cleaned. With less stuff, I need to clean less. Saving me time for more important things. Every time I make it a mission to donate one thing. Sell if it has value. Or just trash it. By doing it every Saturday I free myself of possessions. +Sell your tv. It made me 10 times as productive and less likely to procrastinate. +All the commercials made me want to buy things I really didn’t need. F) Set a goal of when I’ve done x, I get to do fun Y! Y, is your fun reward after you’ve done x. Practice this when you are really struggling to complete something. Take a minute to visualize what you need to do. Visualize what you will do afterwards as a reward. Your reward could be anything you want. Reading a good book. Going to the gym to hit your chest. Call up your girl or go out and flirt with one. Try to implement it in other areas of your life. What stops you from doing X? How can you make it easier to do X? Do X >>> Do fun Y!